Managing Partner, ANTIKA Law Firm. ANTIKA was established in 2010. Since its formation, the firm has built a strong reputation as an independent law firm and continues to grow on the Ukrainian legal services market. 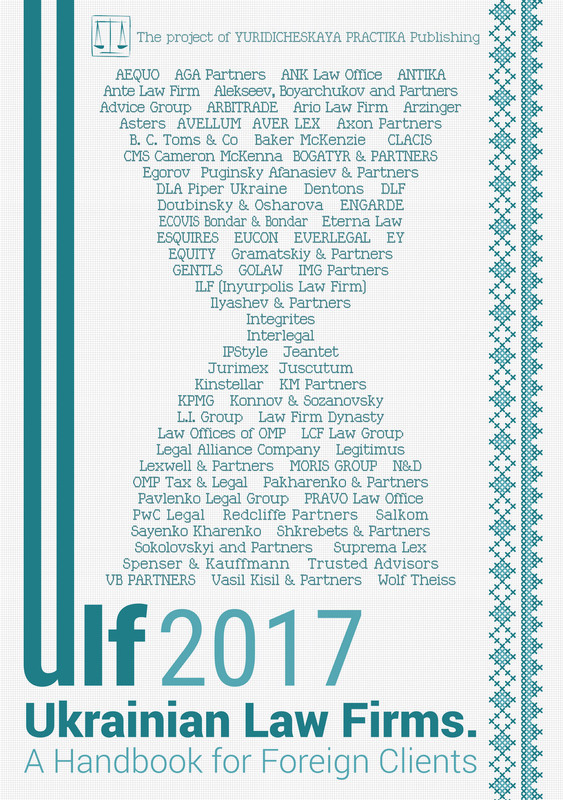 According to the results of research of the legal services market undertaken by reputable international and Ukrainian guides to legal profession like The Legal 500 EMEA, Chambers Europe, IFLR1000 Energy and Infrastructure, Best Lawyers, Ukrainian Law Firms, A Handbook for Foreign Clients, Top 50 Law Firms of Ukraine, Client Choice. The Top-100 Best Lawyers in Ukraine, the firm has been recommended in antitrust, dispute resolution, corporate / M&A, banking, finance and capital markets, real estate, land, energy, subsoil use, energy efficiency and energy saving. The firm received the Legal Award 2012 in the nomination Law Firm — Breakthrough of the Year. The firm is a finalist of the Legal Awards 2013 in the field of Antitrust, Litigation and Real Estate, in 2014-2016 — in the field of Energy. ANTIKA’s team includes 15 lawyers, who have significant experience of various legal practices and provide a full range of legal services to national and international companies that do business in Ukraine, as well as abroad in the following fields: telecommunications, heavy machinery, chemical and food industries, automotive, complex development, construction and real estate, subsoil use, wholesale and retail, media and sports, banks and financial services market, energy efficiency and energy conservation. The firm’s key practices include antitrust, litigation and arbitration, corporate, construction and real estate, subsoil use, energy and energy efficiency, legal expertise. The firm’s main principles are the provision of high quality and timely legal services, strict confidentiality and a bespoke approach to every client’s project. The following are representative clients: AWT Bavaria, ArcelorMittal Kriviy Rih, Cadogan Petroleum, Cargill, Chernomorneftegaz, Deposit Guarantee Fund, Enesa a.s., Esan Eczacıbaşı Industrial Raw Materials, Energobank, FC Dnipro, Ghelamco, Heitman, Henkel Ukraine, Henkel Bautechnik Ukraine, Ibis Group of Companies, Imperial Tobacco, International Resources Group, Lantmannen Axa, MF Telecom, Nadra Ukrayiny, Nasosenergomash, ViDi Group, Ukrnafta. The firm also advises the World Bank, EBRD, USAID, TACIS, UNDP, KfW, NEFCO on energy efficiency, utility and the implementation of other projects in Ukraine. Public procurement is traditionally one of the most topical issues in Ukraine. For many years now the Government has been declaring that it will combat corruption in this field and make the procurement procedure transparent. The law has experienced numerous amendments but, unfortunately, it has not changed the situation significantly. At the end of 2015 a new version of the Law of Ukraine On Public Procurement to regulate relations in this field was adopted. The main peculiarity of this Law was to implement an absolutely new approach to perform procurement procedures, namely, a unified electronic platform called ProZorro, the usage of which should provide transparency and effectiveness in the use of state funds. From 1 April 2016 the system started to function for central bodies of public authorities and enterprises that conducted their activities in the fields listed in the law. From 1 August 2016 the system appeared to be binding for all state and local authorities as well as for state enterprises. — procurement with a price bigger than is stipulated in the Law. According to the open bidding procedure, the estimation of tender bids is conducted automatically based on criteria and estimation techniques specified by the buyer in the tender documentation as well as through the application of an electronic auction. ding consulting services, scientific researches etc. ), — the price plus such estimation criteria as payment conditions, term for performance, etc. Before the electronic auction is conducted the electronic system for procurement automatically opens information on the price and the list of all tender bids placed in the order from the lowest up to the highest price without the names and information about the offerors. If other criteria except price were determined, the electronic system automatically shows them as well as the price. In those cases the value equivalent or ratio of the other criteria shall be determined. The ratio of the price criterion shall not be less than 70%, except for cases of implementation of the competitive dialogue procedure. After the tender bid estimation, the buyer reviews them for their compliance with the terms of tender documentation, starting from the offeror whose tender bid was defined as the most economically beneficial. If such tender bid was rejected, the buyer reviews the next most economically beneficial one out of the list of offerors. Based on the results of such review the report on tender bids consideration is drafted. The buyer publishes it on the web portal. After such report has been published, the electronic system automatically sends out notifications to all offerors. The list of offerors whose tender bids were accepted is published on the web-portal as well. The day and time of the electronic auction are scheduled automatically by the electronic system, but at the earliest 5 days from the day of publication of the report on tender bids consideration. If only less than two tender bids were accepted, the procurement procedure is canceled. The buyer determines the winner and takes a decision to conclude the contract. The crucial innovation in the procedure of open bidding is application of the e-auction system. An auction is conducted through three stages. During each stage the offeror enjoys the right to reduce the price of the tender bid for the one or more auction stages. The offeror whose bid appears to be the smallest at the end of the last stage of the auction is supposed to be the winner. — the subject of the procurement is consulting or legal services, information systems development, program products, scientific researches or experiments or developments performance, design and experimental or construction works performance, the definition of requirements as to their performance needs to be negotiated. The procedure is conducted through two stages. On the first stage all participants are offered to provide tender bids that should include information on compliance with the qualification criteria and requirements stipulated by the buyer in tender documentation as well as the description of the decision on procurement without stating the price. After tender offers are considered, the buyer invites to negotiations not less than three offerors whose tender offers were not rejected at the result of consideration. After negotiations the buyer amends tender documents on technical requirements and requirements to the quality of the subject of the procurement, or defines its new characteristics and invites all the offerors who took part in negotiation to participate in the second stage. At the second stage the offerors should file the final tender bids stipulating the price. The consideration and estimation of tender bids at the second stage is performed through a general procedure stipulated for the open bidding procedure. — procurement of legal services related to protection of rights and interests of Ukraine, including with the purpose of protection of national security and defence, dispute resolution, consideration of cases in foreign jurisdictions with the participation of a party from a foreign country and Ukraine, on the basis of the Decree of the Cabinet of Ministers of Ukraine or Decrees of the National Security and Defence Council of Ukraine. The procedure includes conducting negotiations with the offerors with the aim of agreeing procurement terms. At the result of negotiations the buyer takes a decision on the intent to conclude the agreement. Such a decision is binding for publication within 1 day from the day of its adoption. Another interesting innovation related to the new procurement procedure is introduction of a system of appeal. According to the new Law, the person files a claim on violation directly through the electronic system. The system automatically terminates the procurement procedure and directs a claim to the Antimonopoly Committee of Ukraine. Today, it is not clear whether such procedure will be effective and widely used. In any case the terms to consider the claims will be shorter than they are today due to the application of electronic document management. Evaluating the initial results of the work of the ProZorro procurement system since the time of its introduction, it should be mentioned that problems related to abuses from the side of official bodies, like defining qualification requirements “for their own people”, groundless rejection of offers and others, still remain. Moreover, reasonably, such problems can’t be solved merely with help from the implementation of a new procurement procedure. First of all, there is a need for oversight and to strive towards punishing those people who perform abuse in reality. Despite all the difficulties, we hope that the procedure will enjoy further development and improvement, because its idea of maximum transparency and publication of information with free access allow not only appeal against the results of a procurement procedure, but to guarantee public control in this field, particularly while performing procurement that runs into significant amounts of money.